The purpose of this study was to analyze the effects of exogenous sodium acetate on astaxanthin accumulation and photoprotection in Haematococcus pluvialis at the non-motile stage. Five or 10 mM sodium acetate increased astaxanthin contents more than two-fold as compared with that in cells without sodium acetate after 6 days of incubation, indicating that exogenous sodium acetate accelerated astaxanthin accumulation at the non-motile stage significantly. Addition of sodium acetate inhibited the chlorophyll fluorescence parameters (ΦPSII, Fv′/Fm′, and qL) as well as photosynthetic rates, indicating that exogenous sodium acetate suppressed photosynthetic activity. However, additional sodium acetate increased respiratory rates. It can be speculated that the enhanced respiration plays an important role in the acceleration of astaxanthin accumulation in the presence of sodium acetate, because acetate can be utilized by the respiratory tricarboxylic acid cycle to generate the carbon skeletons and NAD(P)H for astaxanthin synthesis. Moreover, the level of photoinhibition decreased after adding sodium acetate, which is indicated by the fact that the decrease of the Fv/Fm value from predawn to midday declined on day 4 and day 6. NPQ increased significantly with additional sodium acetate on day 4 and day 6, indicating that additional sodium acetate induced a mechanism to protect algal cells against photoinhibition. 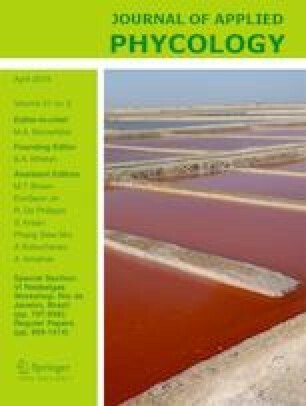 Taken together, exogenous sodium acetate enhances astaxanthin accumulation and the photoprotection capacity of H. pluvialis at the non-motile stage. We thank Dr. John van der Meer (Pan-American Marine Biotechnology Association) for his English editing. Chunhui Zhang and Jianguo Liu designed the study and wrote the manuscript; Chunhui Zhang and Litao Zhang performed the experiments and analyzed the data. All authors read and approved the manuscript. This work was financial supported by National Natural Science Foundation of China (Nos. 31572639, U1706209).